Looking for Unique Gifts? Come Visit Us at the Holiday Fairs! Looking for Unique Gifts? Visit a Holiday Fair in Colorado! Home/Events/Looking for Unique Gifts? Visit a Holiday Fair in Colorado! Can you believe the holiday season is already here? If you’re looking for unique gifts, check out some of the holiday fairs coming up in your community. They are some of the best places to find great stocking stuffers and memorable gifts because of the wide variety of handmade and locally sourced products that are offered. We are excited to share our latest creations and favorite gifts with you at a number of holiday events in our home state of Colorado! Stop by our booth at any one of these events to sample our organically grown hemp-based products and pick up gifts that are sure to please the health and beauty fans in your life. 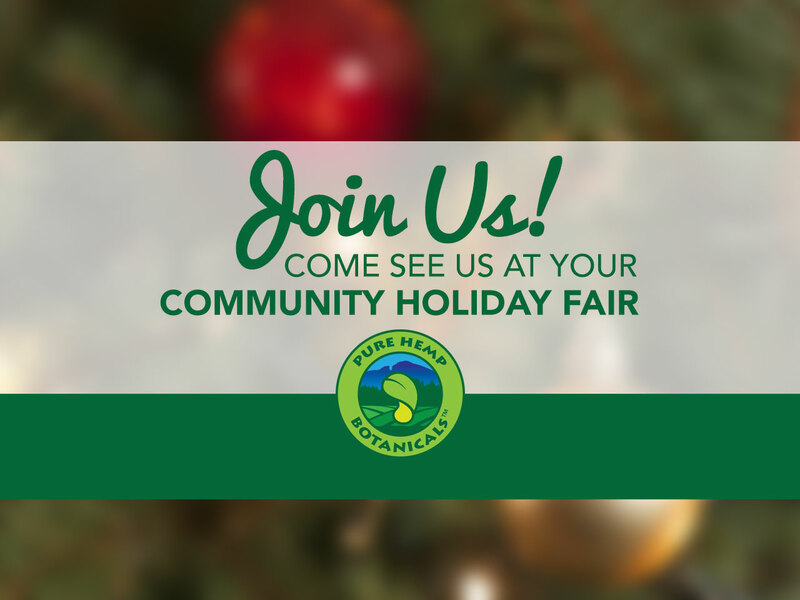 We’ll be sampling our organically-grown hemp products at many holiday fairs in Colorado! One of Entirely Expo’s holiday events, the Small Business Holiday Fair & Artisan show is a fun community event to support local businesses and artists that also raises awareness for local nonprofit organizations. There is something for the whole family to enjoy at this event that attracts more than 140 artisans, crafters, and vendors! There will be door prizes, giveaways, holiday music, kids’ activities, and FREE photos with Santa. You can also participate in nonprofit fundraisers and silent auctions such as the Wall of Wine. Admission is $3 for Adults, and free for Children 12 and under. Visit their Facebook to earn $1 off admission. Get into the spirit of the holidays at the Gingerbread Gift Gala where you’ll be able to decorate cookies, sip FREE hot chocolate and listen to live music! At this festive shopping event, you will be able to peruse the booths of more than 90 exhibitors offering a vast selection of unique gifts and wonderful holiday décor. Admission is free. Entirely Expo’s second holiday event of the season, the Annual Holiday Fair & Artisan show is another opportunity to learn about local nonprofit organizations and support artists and small businesses. Door prizes, giveaways, holiday music, kids’ activities, and FREE photos with Santa make this holiday shopping event fun for the whole family. You will be able to browse fine art, crafts, and locally produced products from more than 140 exhibitors. You will also have the chance to participate in nonprofit fundraisers and silent auctions such as the Winter Wonderland. Visit their Facebook page to learn more. Admission is $3 for Adults, and free for Children 12 and under. Find the perfect Christmas present at the Annual Boulder Holiday Gift Festival! This family event is the biggest holiday shopping event in Boulder with the largest selection of local products, fine art, crafts, handmade goods, and home décor. You will be able to enjoy live music as you search for something for everyone on your shopping at this great holiday event. Admission is free. Last Chance Gift Fest is the perfect holiday extravaganza to end the season! Along with FREE hot chocolate and live music, it offers an outstanding selection of one-of-a-kind gifts, local art, food, and crafts for last minute shoppers. Last year, it attracted more than 140 vendors. If you still have names to cross off of your Christmas shopping list on December 20th, stop by the last shopping event of the season! Admission and parking are free.